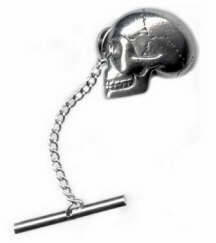 Hand-cast pewter skull tie tack. Measures 5/8" (16 mm) W. Comes in it's own jewelry bag. Coffin necklace in Black Onyx made exclusively for Pushin Daisies!